Back in 1886, Minnesota Point—including the village of Park Point—was not nearly as heavily populated as it is today. Few houses stood along the world’s largest sand bar, and no roads had been built. It was mostly sand dunes and scrub pine. One group of young men thought it made an ideal place to hide the merchandise they pirated away from ships, warehouses, and sawmills. Park Point’s pirates weren’t your typical, cutlass-wielding “aaargh”-exclaiming, peg-legged, hook-handed, eye-patch-wearin’, parrot-totin’ buccaneers of the Caribbean, and they hardly plundered ships for gold doubloons and pieces of eight. 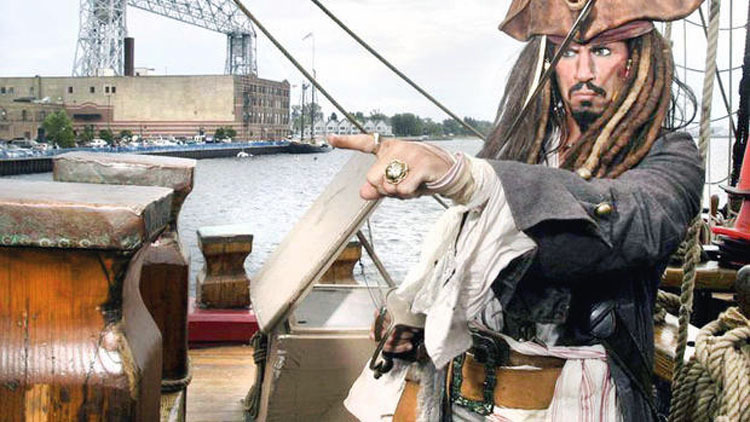 Duluth’s pirates were a band of about six young men who apparently had an aversion to labor and turned to crime on the not-so-high seas to earn their keep. They dug themselves a cave on Park Point at a site close to Thirty-ninth Street, near what in 1906 would become the Duluth Boat Club’s Oatka Branch. With open water on both sides, this was a strategic spot for their operation. While they hardly fit the stereotype, their style was not much different than traditional pirates. They plundered various vessels, sawmills, and warehouses. Apparently, the cave was a temporary lair, and the pirates’ goal was to set up permanent housing on the point, as the lumber they stole was used to build a house. Much of that lumber was taken from the mill of Duluthian R. A. Gray, and Gray had had enough. When Duluth’s buccaneers tried to make off with more of his lumber one night, Gray decided to do something about it. He watched, then pursued the thieves. But the band of ne’er-do-wells had a large sailboat and managed to escape in the Lake Superior darkness. The patient Mr. Gray eventually found their cave—and his lumber, in use in the unfinished house—and captured the gang after a struggle that history books called a “fierce battle.” The half-dozen or so thieves all ended up in the penitentiary.